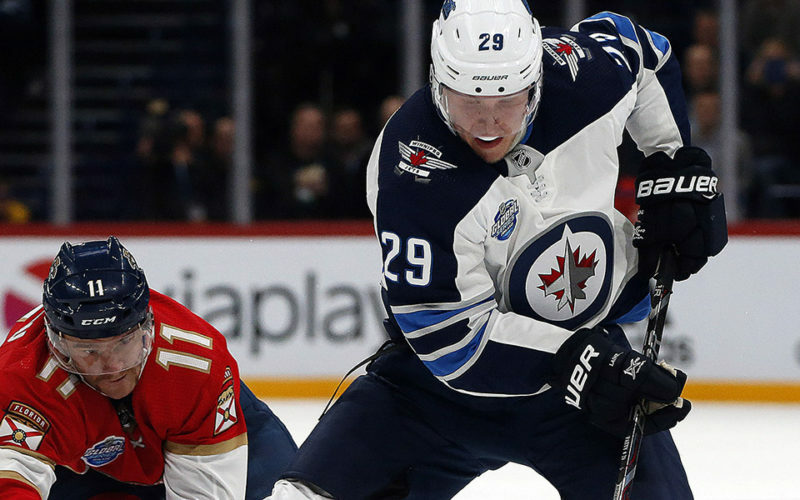 The Winnipeg Jets meet the Florida Panthers tonight in the second of two games during the NHL Global Series in Helsinki, Finland…Patrik Laine’s hat trick powered the Jets to a 4-2 victory last night…These two games are the back half of a four-game road trip for the Jets, which started with a 2-1 win against the Detroit Red Wings last Friday before a 3-2 loss to the Toronto Maple Leafs on Saturday…After returning from Finland, the Jets begin a four-game homestand against the Colorado Avalanche on Nov. 9. These two games mark the second of 10 back-to-back sets the Jets have this season…Winnipeg split last weekend’s back-to-back set in Detroit and Toronto…Last season, the Jets went 4-3-2 in the first game of back-to-backs and 4-4-1 in the second game…Nineteen of Winnipeg’s 20 games in back-to-back sets this season are on the road. Tonight is the last of five consecutive games for the Jets against an Eastern Conference team…The Jets are 3-2-0 against Eastern Conference teams this season…Winnipeg went 19-7-6 against the Eastern Conference last season, including a 10-3-3 record versus the Atlantic Division and 9-4-3 record against the Metropolitan Division…Blake Wheeler led the Jets with 37 points (10G, 27A) in 31 games against the Eastern Conference, which was tied for fourth among Western Conference players last season…Goaltender Connor Hellebuyck went 15-3-5 versus the East. The Jets have scored a power play goal in nine consecutive games, going 11-for-31 (35.5%)…The Jets have set a franchise record for most consecutive games with a power play goal…Winnipeg is 31.7% on the power play this season, which is third in the NHL…Patrik Laine is tied for the NHL lead with five power play goals this season. Patrik Laine tallied his fifth hat trick of his NHL career last night…Despite only playing just more than two seasons with the Jets, Laine is second behind Ilya Kovalchuk (11) for the most hat tricks in franchise history…He doubled his season goal total with the hat trick…Laine leads the NHL with five go-ahead goals this season, including two last night…Since his first season in 2016-17, Laine is second in the NHL with 15 go-ahead goals, one back of Alex Ovechkin, and is already tied for fourth in franchise history. Blake Wheeler and Dustin Byfuglien each had three assists last night…They matched Jacob Trouba’s three-assist game on Oct. 20 vs. ARI for the most assists in a game by a member of the Jets this season…Wheeler has an assist on all six of Laine’s goals this season, including the primary assist on four of the six goals…Wheeler’s nine power play assists lead the NHL, while his 12 assists are tied for fourth in the NHL. Blake Wheeler’s three assists last night extended his point streak to seven games (1G, 9A), which is the longest scoring streak by a member of the Jets this season…Mark Scheifele (4G, 5A) in on a six-game point streak. Mark Scheifele was named the NHL’s Second Star of the Week on Monday for the week ending Oct. 28/18…He tied for an NHL-best seven points (4G, 3A) for the week…This is the fourth time in his career that Scheifele has been selected in the NHL’s Three Stars of the Week…He is the first Jets player to be selected in 2018-19 after Winnipeg had eight appearances in the Three Stars of the Week last season. The Jets have drafted four Finnish-born players since 2015 – Sami Niku (2015), Patrik Laine (2016), Kristian Vesalainen (2017), and Santeri Virtanen (2017)…From its first draft in 2000 to 2014, the Jets franchise had drafted a total of seven Finnish-born players…Aside from Laine, who is currently with the Jets, Niku and Vesalainen have also made their NHL debuts with Winnipeg…Virtanen is currently playing in Liiga with SaiPa. Jets defencemen Dustin Byfuglien and Dmitry Kulikov played in Helsinki during the NHL’s Premiere Series in 2009 when the Chicago Blackhawks played Florida…Byfuglien had a goal and an assist to lead the Blackhawks to a 4-0 win against Kulikov’s Panthers…Tyler Myers played for the Buffalo Sabres in a game against the Anaheim Ducks at Hartwall Arena in 2011…Head coach Paul Maurice was the head coach for the Carolina Hurricanes in 2010 when they opened the season in Helsinki against the Minnesota Wild, leading his team to the win in both games.